Michelle Obama's first steps onto the enormous, exhilarating, terrifying national political stage were reluctant -- cautious, even. The beginning was not so easy, when the Obamas moved into the White House and had to adjust to life behind bulletproof windows. "I will never forget that winter morning as I watched our girls, just seven and ten years old, pile into those black SUVs with all those big men with guns. I saw their little faces pressed up against the window, and the only thing I could think was, 'What have we done?'" Obama said. She attracted criticism even before the election after saying she was "really proud" of her country "for the first time in my adult lifetime." That comment sparked a critical New Yorker cover, but she's come a long way since then, finding her footing and her causes. By her husband's second term, she appeared much more comfortable in public. She was more polished and began to loosen up on social media. She blossomed in the public eye, embracing the opportunity to let her voice be heard -- including her fashion voice. Obama has appeared on the cover of Vogue three times, and has come to be regarded as a fashion icon. 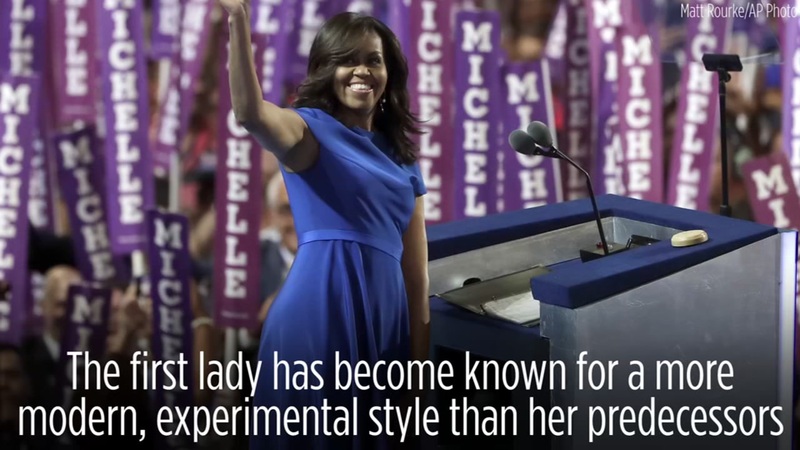 The first lady has become known for a more modern, experimental style than her predecessors, and Monday night was no exception. America has watched the Harvard-educated lawyer and mother use her humor, her star power -- and even her viral meme power -- to create change. As her time in office drew down, the once reluctant but now determined First Lady called upon her sweeping popularity to enter the campaign trail as one of the most powerful voices for her party. "I wake up every morning in a house that was built by slaves, and I watch my daughters -- two beautiful, intelligent, black young women -- playing with their dogs on the White House lawn," she said during an impassioned speech at the 2016 Democratic National Convention. First Lady Michelle Obama takes the stage during the first day of the Democratic National Convention in Philadelphia , Monday, July 25, 2016. She took on Donald Trump's Access Hollywood tapes. "It has shaken me to my core in a way that I couldn't have predicted. It is cruel. It's frightening. And the truth is, it hurts," she remarked on the campaign trail for Hillary Clinton. In her final speech as First Lady, her emotion was raw as she once again urged Americans not to give up, to celebrate diversity, and to use education and talent to better their nation. "Thank you. Thank you for everything you do for our kids, and for our country. Being your first lady has been the greatest honor of my life, and I hope I've made you proud."